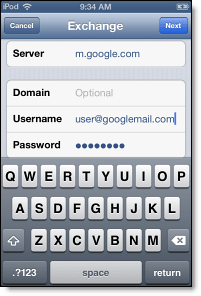 After moving from a hosted Exchange service to GMail, you need to set up your email client on the iPhone so that it will receive the push notices. Alternatively, you can use the standard GMail settings, on the iPhone, but my favorite approach is to actually use the GMail app from Google in the App Store. The reason I like that app over the standard iOS mail app is that it is much more of a true mobile client that takes advantage of the platform. You can do this either from your iPhone/iPad directly, or using the iTunes store on your Mac/PC. Once you have the app installed, you need to set up your GMail accounts. Either tap “open” from the App Store page about GMail, or find the GMail icon and launch it. On launch the app will prompt you to log into your account. For a Google Apps account, this will be the email your administrator assigned you like rob@mydomain.com, and the password that you’ve set up previously by going to http://gmail.com. 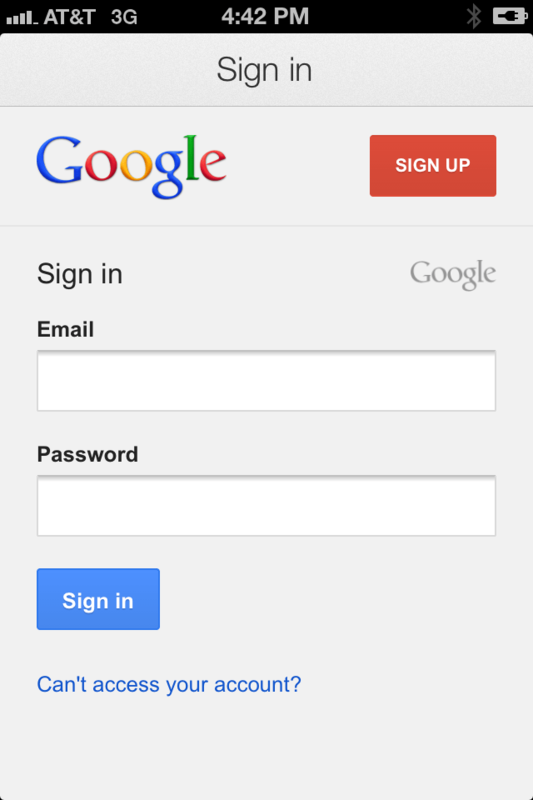 Launching the App the first time takes you to the login page, where you can type in your email address and password. Note that this is the same whether you are logging in to a GMail account or a Google Apps account, to Google they are just different users as far as mail goes. 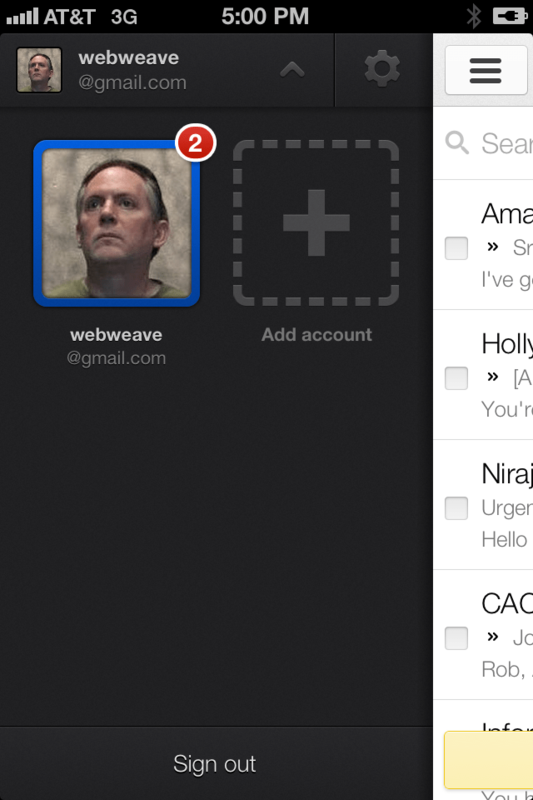 Once you log in, you will be shown the inbox for that account, and be able to read your email pretty easily. To navigate the folders (like sent, draft, etc), you tap on the little icon in the upper left corner that looks like a box with stacked bars. This will cause the folders and settings pane to slide out from the left and reveal your email structure so that you can choose. 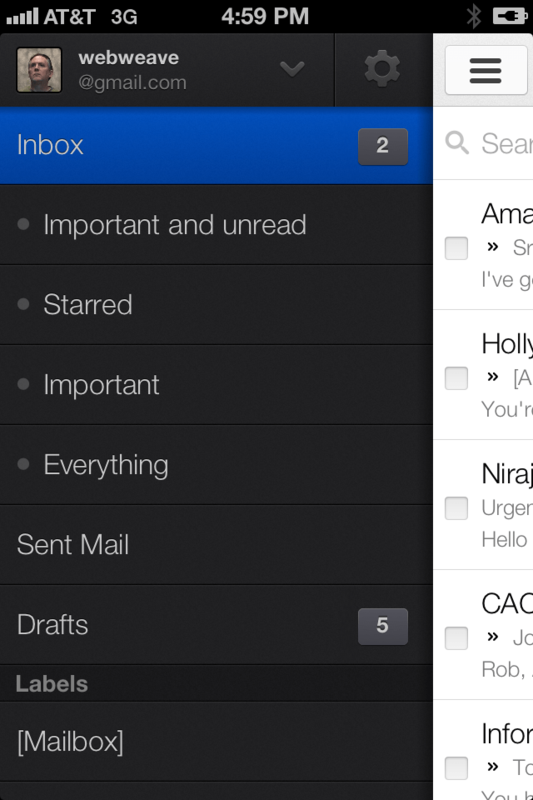 Clicking on a particular folder will display that list in the same fashion as you saw with the inbox. 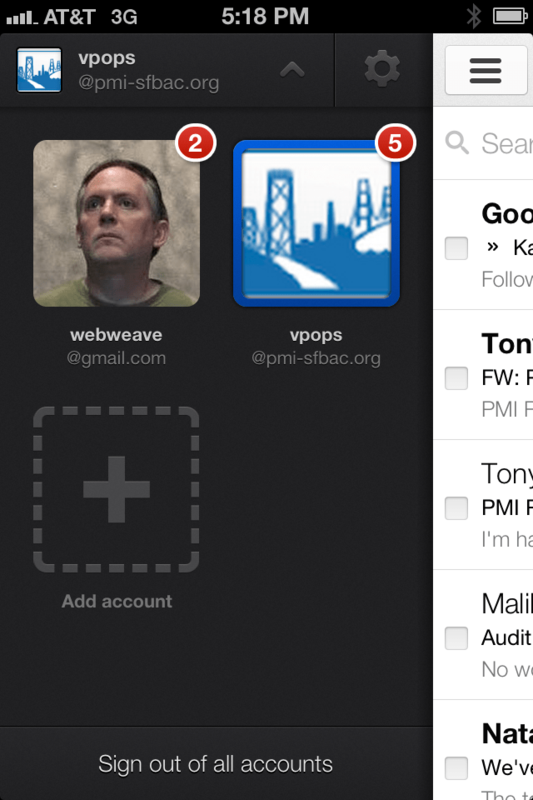 Additionally from this screen, you can add other email accounts by tapping on the profile area at the top of the pane, which slides the list of accounts down and changes the direction of the panel indicator at the top of the pane. If you’ve already done this, you will see the list of accounts, and each one will be badged with the number of unread messages. Adding a new account is as simple as tapping the large plus icon and logging in. Tapping on a profile picture will switch you to that account once you are logged in. The little gear icon in the upper right of this corner brings up settings for you email where you can set a few things (such as vacation responder, signature, etc). The next time that you go to the account selection page, you’ll see a list of accounts with the icon for each badged with the number of unread messages showing so that you can easily see what needs your attention at the moment. 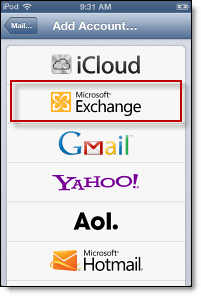 Google apps on the iPhone are a mixed bag, with some being native, and others not, so it’s also a good idea to set up the Apple “Mail, Contacts, Calendars” for synchronization of those things (which can use the Exchange push in the same way as an actual Exchange server). First go to your settings (normally you can find this by clicking the home button on and looking for the gear icon that says “Settings”. If you’ve previously added accounts, the “Add Account …” will appear below the existing account settings list (in my case I actually have to scroll in order to get to this button. Once you tap on the Exchange button, you’ll get a new page that prompts you for the authentication information. This uses Microsoft’s autodiscover method to figure out how the account should be configured. 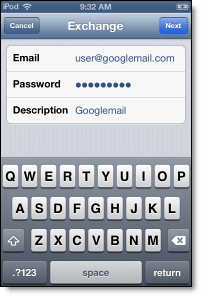 Type in the user name and password for your account here, and give it a description. Typically I use the name of the company that has the domain that I’m adding (for example PMI-SFBAC for my pmi-sfbac.org address). Then click the “Next” button which should bring up the Domain screen. The only thing you need to make sure of is that the server ends up being m.google.com, and that you still have the right username and password. To continue, tap “Next”. The final step is to choose what you want to be pushed to your phone. Generally the important ones are the contacts and calendars, since those are business related. It really doesn’t hurt to have Mail turned on as well, since that keeps your inbox in the iOS Mail app up to date, but if you’re worried about your data plan, just set up the contacts and calendars, since that is the part that the GMail app won’t really be as helpful with. 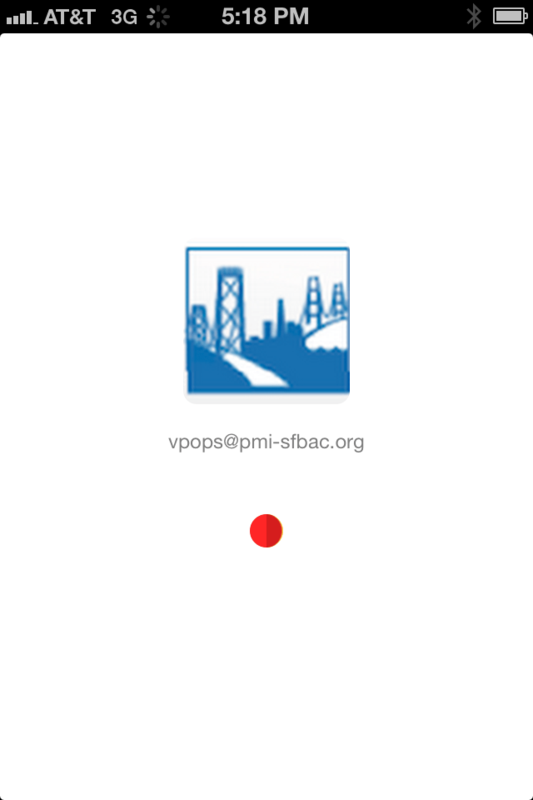 I volunteer and provide technical support for a few non-profits, one of which is the Project Management Institute San Francisco Bay Area Chapter (http://www.pmi-sfbac.org) where I serve as the VP of Operations and CGO. One of the moves I made in my first year with them was to migrate our event calendar to Eventbrite and Meetup. One of the gaps I found with Eventbrite is that it doesn’t have a way to provide a feed of events that can be used to update an external calendar, so I embarked on a little programming effort to create one. Most calendar programs allow you to pull external events using the iCalendar (ics) format, and Eventbrite actually has a pretty decent API to allow you to pull the events, so I decided to write a simple PHP script to allow me generate an iCalendar feed. Looking at the code, you can see it’s pretty basic, just a few PHP classes, some unit tests, Netbeans project and data. Once the code was working, I used the iCalendar validator at http://severinghaus.org/projects/icv/ to make sure the results are good, and (at least for PMI-SFBAC) they are. Eventually this results in a URL that I used as a feed into the All-in-One Calendar from Time.ly which lets me show events on my site’s calendar along with any other iCalendar feeds I choose to add. 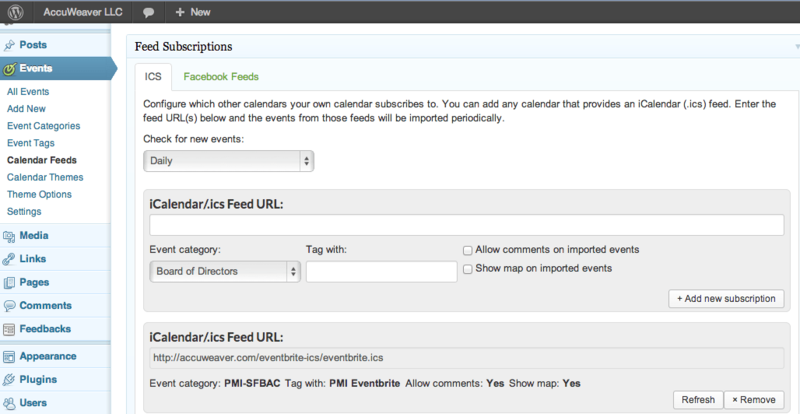 To configure the All-in-One calendar, I just go to the Events in the WordPress admin panel, and add the feed. After I add the feed I click the “Refresh” button to make sure the events show up on my calendar immediately. The events then get updated on a periodic basis (daily by default), and should keep you up to date. 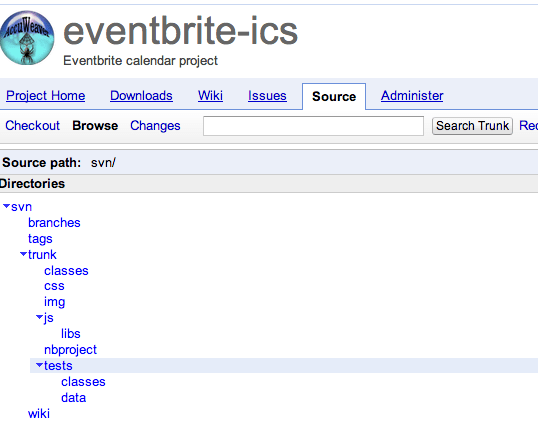 Another use I put this feed to is to add the Eventbrite calendar to my Google Calendar. I have a calendar feed from Meetup, and several of my friends so that I can quickly see what is going on that day. The same basic idea for Google Calendar: you go to your Google Calendar, click the drop down on “Other Calendars” and choose “Add by URL”. This gives you a nice view of events so that when you are scheduling things you can see what’s coming up that you might be interested in. I got an email from my friend Athens who had just relaunched her web site at http://www.athenskconsulting.com/ but was now having problems with email. The first thing I did was to run over to the MX Toolbox site to see what was going on with her servers. A quick look and saw that her mail servers were pointing to mail.athenskconsulting.com, which resolved back to her WordPress blog. Before she pointed everything to her WordPress site, everything had been working. Unfortunately, the directions at http://en.support.wordpress.com/domains/map-existing-domain/ had given her some unfortunate information, that really weren’t accurate for what she was trying to do. Her DNS and email were previously hosted at GoDaddy (along with her old web site), and all she was really trying to do was to get her company URL to point at the blog site that she’d set up on WordPress. The instructions I mentioned before give a way to accomplish that, by repointing the domain DNS servers to be the ones that WordPress provides. Now this might be OK if you are a geek and know what MX and CName records should look like, but typing in a DNS file in the format that WordPress expects it is much more difficult than using the GoDaddy DNS control panel (which helps prevent you from making mistakes). I got on the phone with her, and the first thing I had her do was to switch her DNS servers back to GoDaddy. 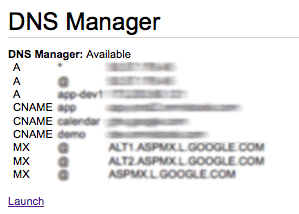 This is done by going to the Domain Manager page in GoDaddy and looking for the section that says “Name Servers”. This of course fixed the mail problem (along with other URL’s), but broke her web site again (which I expected it would). This gives you the basic information that you might have needed if were you going to follow the instructions on the WordPress site. 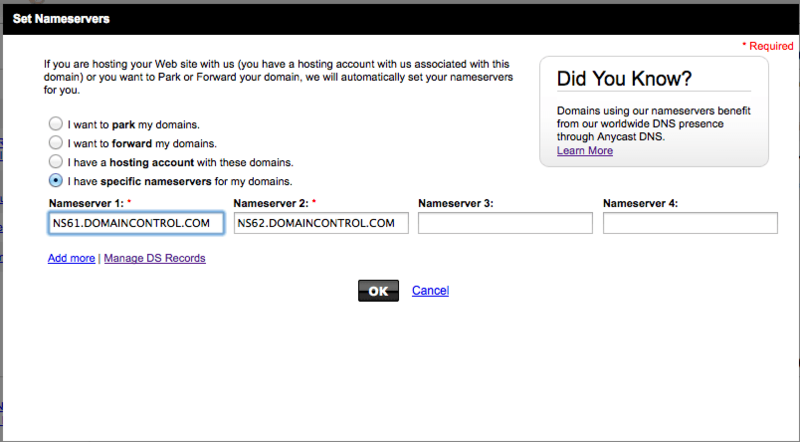 It creates a text version of the information of the DNS Zone records in a standard format. But unless you really need to move off GoDaddy for some reason, you don’t want to do that. Instead, you just need to set up a wildcard CNAME record for the WordPress blog, and make sure to remove any old A records that might be pointing to the wrong place. 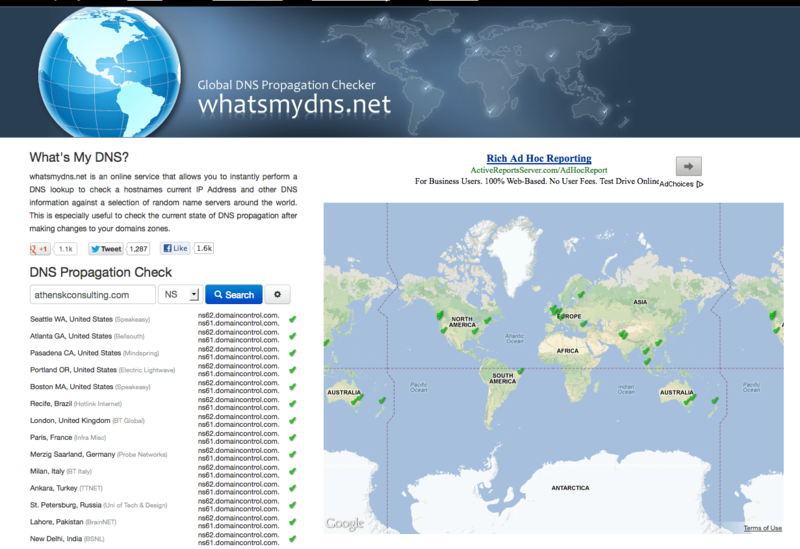 The one other thing I do to make sure things are working is a DNS propogation check (http://www.whatsmydns.net/), which shows which servers will resolve the host and which don’t. All the little green checkmarks mean everything is happy all around the world, and now everybody is resolving her site properly. I am a big fan of Test Driven Development (TDD) and tools like Hudson/Jenkins to automate the process of having a continuous integration build system are key. On my current project we recently started moving things to Amazon EC2, and rather than put everything on one big server, I thought I’d follow the best practices in cloud computing and make a number of small special purpose servers to take care of the project’s needs. We’ve had a Jenkins server running for a bit, so rather than reinventing the wheel, I figured I could copy my Jenkins configuration to a new server and get things up and running. I fired up a new Tomcat server on Amazon Elastic Beanstalk, and loaded up the Jenkins WAR file, which quickly got me to a working Jenkins server. This project is written in PHP, so I had to install PHP after that, which meant logging in to the server and running through the whole PHP and PHPUnit setup. Once that was done, I scp’d the Jenkins folders from the old server, edited the Tomcat startup files to include the environment variable to point Jenkins to the right place, changed a few permissions, and everything appeared to be working. I could log in, I fired up the build, and it appeared to be running – very cool. But that was when the flaw in the design of the PHP unit tests was exposed …. And of course there were 5297 of these … I did some Google searches for the PHP_Invoker_TimeoutException which mostly pointed to issues with upgrade from one version of PHPUnit to another, but the versions on the old server and this one were the same. So my next step was debugging an individual tests. Running the test from the command line gave me the same error, odd. But then I ran the test using php instead of the phpunit call, and found the problem: I was getting a timeout trying to open a database connection. The issue as it turns out, is a design flaw in our code that hadn’t showed up before: all the classes invoke a database connection class that sets up the connection to the database as soon as they are loaded. Since the Elastic Beanstalk server was in a different security group than was allowed to connect to the RDS database, it was unable to connect at all, and PHPUnit would simply timeout before the connection failed (by default phpunit sets 1 second as the acceptable for a test to run in order to catch endless loops). Now in theory our tests shouldn’t be hitting the database (at least not for these unit tests since we don’t want them updating anything on the backend), so this problem turned out to be very fortuitous. Because the Jenkins server couldn’t reach the database, it exposed a flaw in our unit tests: we weren’t mocking all the things we needed to, so the tests were actually opening connections to the database. With some refactoring of the test classes to mock the database access layer, the tests all succeeded. Next we’ll need to do the actual DBUnit tests for the database, and Selenium or HTTPUnit tests for all the front-end and AJAX stuff. I needed to convert an existing Netbeans build to use Maven in order to stabilize the code and support Test Driven Development. Generally this was a fairly simple process: just move all the source files and resources to the right folders in a new Maven project, and add the dependencies. Now at this point I normally just do a few Google searches and find out how somebody else has solved this problem, but I really wasn’t having any luck at all finding an answer. I did run across a couple of posts that mentioned seeing this error when using multiple persistence units in the persistence.xml. Now my project does have a persistence unit for testing outside GlassFish (my chosen EJB container), so my first thought was to move that PU to the “right” place for my tests. So I copied the persistence.xml from src/main/resources/META-INF to the src/test/resources/META-INF and changed them so there was only one PU in each. So doing a bit of digging, it appears that the persistence.xml only gets copied once and only from the src/main/resources/META-INF folder. I must have tried a thousand different permutations and combinations until I realized that I could have an ugly workaround that is not ideal. The issue is that if both have the “exclude-unlisted-classes” set to true, the javac compiler tries to recreate the annotation classes during the compiler:compile and of course fails on the second PU because the classes have already been created. So to get this to work, I set the “exclude-unlisted-classes” to false for one of the PU’s, which gets me the generated meta classes, and the tests fail (because the PU doesn’t include the required entities). I then flip the flag back to true, and run the build again. Since the classes have already been compiled, the compile:compile doesn’t run, and the tests can succeed. And then finally, I run across a bug report on the NetBeans site: http://netbeans.org/bugzilla/show_bug.cgi?id=183779. Now this bug talked about setting some compiler flags (in particular -proc:none which tells the compiler not to generate meta classes). Now my Maven build works like a charm. Both persistence units are defined in my persistence.xml, and both have the “exclude-unlisted-classes” set to false, and not only do my tests work, but the deployment is now successful as well.